Totally unprepared today, forgot my glasses & phone. 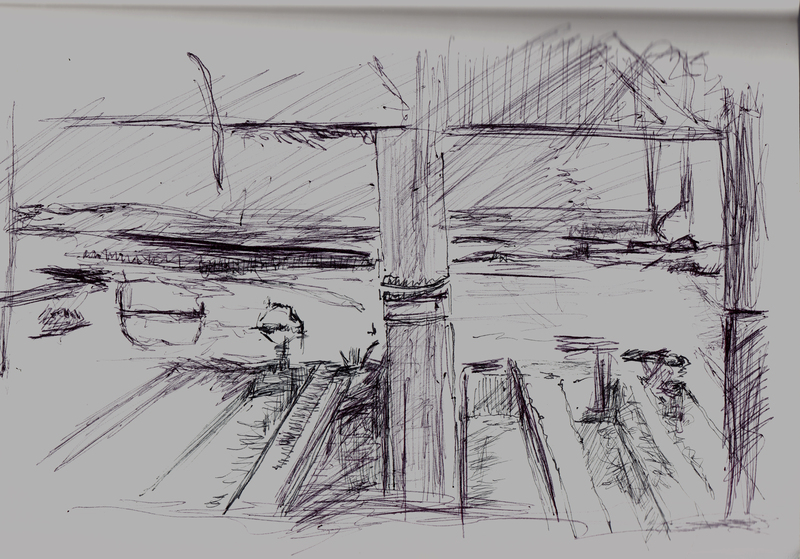 Standing under a bridge for shade so very quick drawing. I did this on my way to the supermarket today. I had another bad night sleep so struggled to keep going today. Managed to get for my run in the morning as I need to train for the 5K I have entered on Nov 1. I was originally going to sketch this morning but my youngest daughter was home and talking to her seemed like a much better idea than going out again. But it was nagging at me all day so I decided to do a quick session before shopping. Originally when I set out I was going to do a small watercolour and searched out my tiny Windsor and Newton pocket palette that I have had since college. I am not fond of watercolour as I tend to end up with ‘mud’ as I have difficulty controlling the medium. I thought with the limited 12 colour palette I had a better chance of controlling it that the big one I inherited from my Mum (30 blocks). I walked along the Bohls loop part of the trail through Pflugerville and eventually decided on a shady spot under the bridge that takes the FM1825 road over the trail. It was then I realised I left my glasses and phone in the car which was parked about ½ mile away. I decided to just get on with it as I could see the view OK, just not the paper I was drawing on too well. As I was standing with no available place to set my watercolour palette anywhere I decided to use a pen. The first pen was too scratchy ( Pilot Precise v5 extra fine) and I changed to just a standard biro pen. I often view a scene with one eye close as I have a lazy eye but I usually put my glasses on to draw as I really cannot see the paper that well without my bio-focals these days. As I was drawing today all I could really see was a blur which if I really concentrated I could see but then it would blur again and often doubled as my eyes struggled to focus. In the end I decided to just draw with one eye closed most of the time. As I stood, I could feel the sweat dripping down my face, not pleasant. As I said in my notes, in the end I lost my concentration and it really was too hot to be standing still for too long. Fortunately the weather is starting to moderate as autumn approaches although no doubt the mid 90’s will prevail for another month. By October we should start seeing the 80’s again which mean high 60’s/low 70’s for the morning. Really looking forward to the cooler weather! Maybe I will make a stab at watercolour tomorrow. ← a little night time stress reliever. All things considered I think you’ve made a lovely, atmospheric sketch considering you’d forgotten your glasses.